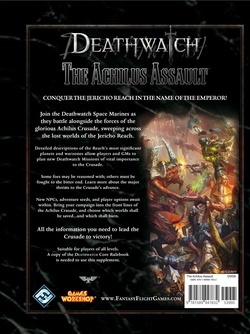 The Achilus Assault is an invaluable sourcebook for Deathwatch, and is a guide to the fires of war raging in the Jericho Reach, from the numberless tides of the Tyranids in Hive Fleet Dagon to the hellish legions of Chaos pouring forth from the Hadex Anomaly and the expansionist aggression of the Tau Empire. The threats presented in this tome provide Game Masters with a surfeit of antagonists and mysteries to confront a Deathwatch Kill-team. 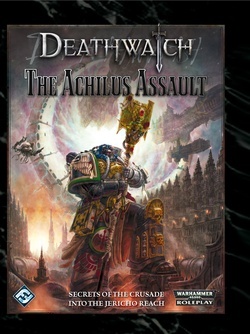 The essence of war, brotherhood, heroism, and duty pervade the setting for Deathwatch. The task of the Achilus Crusade embraces all of these themes, yet it faces great challenges from both without and within. To live up to these ideals is a difficult task, yet it is the fate of the Deathwatch Space Marines in the Jericho Reach to shoulder this duty head-onâthey are the first and last line of defence against a myriad of threats to the Crusade of which some commanders are not even aware. 004 | Whatâs in this book? âThe Bolter and Chainsword Playtest Groupâ Ryan Powell with Matt Bogart, Jon Cox, Max Hardenbrook, Matt Hunt, Steve Koelzer, Anders Lang, and Richard Sanders, âNo Guts, No Gloryâ Sean Connor with Adam Lloyd, Aaron MacManus-Wood, Stephen Pitson, Mark Smith, and Simon Tierney, âThe Librariansâ Pim Mauve with Keesjan Kleef, Jan-Cees Voogd, Joris Voogd, and Gerlof Woudstra, âRoll Perilsâ Matt Eustace with Sean Kelly, Rob Lord, Stuart Lord, and Mike Madani, âVeterans of a Psychic Warâ Benn Williams with Chris Lancaster, Scott Philips, John Ross, Rebecca Williams, and Eric Young.